This is the first time the hosts have ever played in the Eurocup but the away team will be very familiar with the task that awaits them this season. 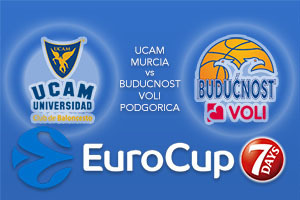 This is because this will be the 11th campaign that Buducnost have played in the tournament and this is going to be their seventh season in a row in the Eurocup. It will be interesting to see whether home advantage can nullify the experience of the away side in this game. The hosts are still celebrating the capture of Julen Olaizola and he is the sort of player who should make a big impact on this campaign. It will be interesting to learn how Murcia take to European basketball but they’ve been building steadily for a number of seasons and this is the natural step for the team. Captain Jose Angel Antelo will pull the string and if Vitor Faverani has a big night, you can be confident that there will be no shortage of effort and excitement from the hosts. It is shaping up to be an intriguing night in Group C.
While the absence of Suad Sehovic is a blow for the away side, Buducnost are boosted by the form of his brother Sead. When it comes to being a threat around the perimeter, this is the player that will make a difference. Sehovic, Boris Savovic and Bojan Subotic are likely to be key players for the away team who will want to get a good performance and result from their trip to Spain. Budocnost come into this campaign on the back of a hugely successful domestic campaign and they will be keen to continue their form from last year while adding something to their experience in the Eurocup. The excitement of the home game could well be enough to pull the hosts though and taking UCAM Murcia at -7, at odds of 1.90 is a smart bet. If you’re looking for the Over/Under market, have a look at going OVER 157.0 which you can find at odds of 1.90. Bet Now!